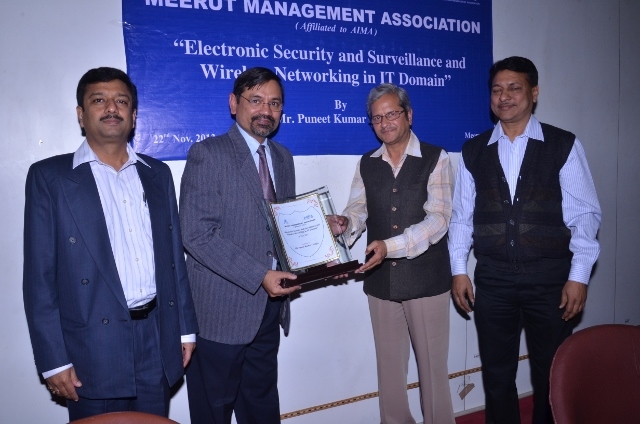 A Workshop on Electronic Security and Surveillance and Wireless Networking in IT Domain was held on 22nd November 2013. Mr. Puneet Kumar Gargya gave us an insight about Electronic Security and Surveillance and Wireless Networking in IT Domain in all types of businesses. These days it is in practical use in Retail and Household for tracking and security issues. MMA members had learned different process and agreed to implement it in their factories, showrooms and residences. Capt. V.K.Gupta was the event Chairman of this program.